This itinerary alternates walls and grassy ledges but without any overhang. It is ideal for beginners who want to familiarize themselves with the vacuum. The via ferrata is well equipped, stiff but without overhang and features a loophole mid-term. Drive to Villar d'Arène, between La Grave and the Col du Lauteret. Just after the village, when coming from Grenoble, take the road to the Pied du Col du Lautaret, then right at the following crossroads. Park just after the Pont des Brebis bridge. In the foothills of the Meije, this north-facing climb will be a cool choice in the summer. IGN top 25, 3436 ET, Meije, Pelvoux. Les via ferrata autour de Grenoble et Briançon, éditions Glénat. Toutes les via ferrata de France, éditions Libris. You can stay cool on this Via ferrata in the summer, thanks to its north-facing position in the foothills of the Meije, next to the Romanche river. The first part, over a 20 m section, will warm up your fingers before tackling the most interesting part of the Via, namely a steep pillar. A slab then leads up the left-hand side of a fine ridge. You then reach a grassy plateau, with an escape route off to the right. The second part climbs up a lovely slab with an overhang, ending on a less steep spur. The final few metres of the Via ferrata are more like a slightly scary, steep hike, enabling climbers to make the most of the views over the Agneaux. The return path is well-signposted. While in the area, take time to explore Villar d'Arène in the Upper Romanche vallry. It's set among breathtaking high-mountain scenery. Nearby, in La Grave, the Reine Meije cable car whisks you up to the glaciers in just 30 minutes. 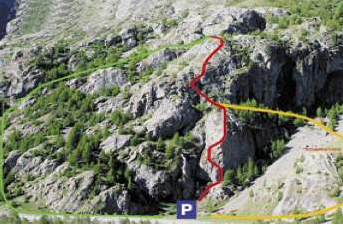 Track .gpx "Via ferrata d'Arsine"